Start paying for everything with PayOdd. People like you make PayOdd their everyday choice for their money transfers, purchases, paybacks, bill payments, and fund requests. Why not try it yourself? PayOdd is simple to access, and easy to use. Try it today. Sending money to a friend or family member or anyone happens instantly. An SMS will be sent to your friend informing them of their pending money they are going to receive. The receiver does not need to be a PayOdd registered member for you to be able to send money to them. PayOdd offers you the ability to setup a friends list which will allow you to pay a whole list of friends in one transaction. The ability to effect bulk payments allows our network users to enjoy FREE unlimited, and flexible payment initiations while on the GO! If someone owes you money, you can send them a request for the amount they owe you and receive payment via PayOdd. An instant text (SMS) message will be sent to their mobile number via PayOdd to let them know you'd like to "get money" from them. They can accept your request on their mobile phone and remit payment to you. As soon as accept to send you money, PayOdd will process the payment initiated by them into your personal PayOdd account for you to access and use. PayOdd can be integrated into any website or mobile application within minutes, no programming skills needed. This will allow you to start making sales very quickly and receiving payments from your customers and potential clients anywhere, anytime. 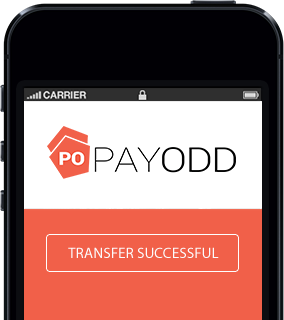 PayOdd provides your business the flexibility of accepting and receiving mobile payments or wallet payments from your customers. We provide you with the world's first Software as a Revenue (SAAR) model that doesn't cost any money to implement. We offer services that will enhance your existing channels of revenues and in the process provide new and exciting customer attraction to your business. Our offering also helps improve your customer retention and hence increase growth of your business through patronage of mobile consumers worldwide. Would you like to find out more about PayOdd? Have questions about PayOdd? Just ask! Send us a message, and we'll follow up with you shortly. Copyright © 2019 PayOdd. All rights reserved. Users are advised to read the terms and conditions carefully.